Every day, across the world, meetings focused on enterprise business growth and productivity are taking place. During these discussions — held in boardrooms, ballrooms, and the local drip and sip — the nitty-gritty details of organizations’ operational efficiencies are being dissected. Why aren’t we managing staff time better? What’s the best way to leverage automation? And how do we build the bottom line by bringing in new customers, and retaining the ones we already have? And the build it vs. buy it saga begins. There’s no denying it. Online appointment scheduling is increasing in popularity. At this point, most of us have made some type of appointment online, whether it’s a haircut, massage therapy session, or tire change. A recent report shows that 51% of American consumers prefer to shop online, from clothing to travel planning. It makes sense that they’d also want to book their appointments via the web as well, and savvy companies are keeping up with this change in customer experience. What many enterprises do not realize as they delve into discussions about adopting an online scheduler is that scheduling is inherently complex. It’s a key factor that doesn’t always come into play as larger organizations grapple with whether they should build or buy their own solutions. After all, their teams are resourceful. They understand technology. Their staff may have even built other in-house legacy apps. Scheduling? Pffffft. It’s just scheduling. How hard could it be? Thus begins the search for a viable SaaS scheduling solution. 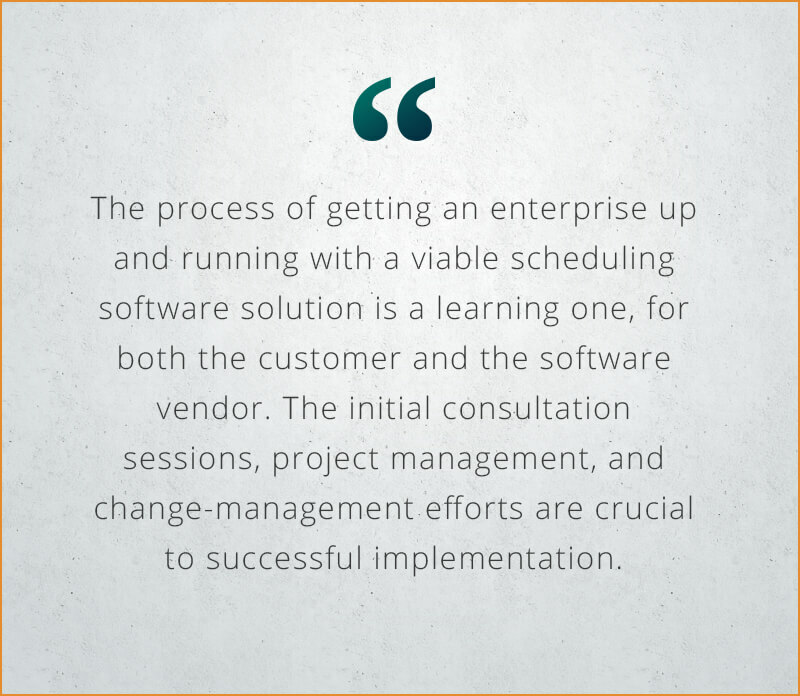 The process of getting an enterprise up and running with a viable scheduling software solution is a learning one, for both the customer and the software vendor. The path to success can be full of potholes, curves, wrong turns, and eventual dead-ends if not approached carefully. The initial consultation sessions, project management, and change-management efforts are crucial to successful implementation. From my point of view as a SaaS provider, I feel a great deal of responsibility. My team must provide a reliable service that meets the SLAs of growing enterprises, including solid support systems, security, and scalable platforms. The pressure is on to think large and always seek ways to scale. Thorough research and an understanding of the customers’ business requirements and current processes are not “nice to haves,” they’re dealbreakers. Some organizations make it easy: they come to the table with clear objectives, detailed requirements, documented use cases, and perhaps even some mockups in hand of what they are looking for in a solution. Others grapple with assumptions about what a scheduling software solution does, unknown variables, lack of business requirements, and no clear project owner. Though we of course love the former type of client, my team is dedicated to working with both fully and lesser-prepared enterprises, and we do everything in our power to avoid communication blunders that result in implementations never getting off the ground. One of the first questions my team gets asked during the planning phase is, “So when will it be ready?” It’s a valid concern, and one requires a good deal of managed expectations. Gone are the days when the “typical implementation” of a scheduling solution is up and running in days, a month, or even several months at the enterprise level. That’s because enterprises demand scheduling systems that can enforce structure, adhere to rules, scale, and be highly configurable and available (API’s, web services). And these aren’t built overnight. STEP 1: We Consult — In this first phase, we consult with the enterprise to assess the current scheduling process, address challenges, and define and refine specific business needs. STEP 2: We Design — During the design phase, our Professional Services team works with the enterprise team to design a seamless scheduling system that meets the business’ unique requirements. STEP 3: We Build — Our engineers build a customized solution, following a collaborative project management process. STEP 4: We Train — To ensure a successful implementation and long-term success, our Professional Services team trains an organization’s staff members across all locations to use the new scheduling software. STEP 5: We Deploy — Once the enterprise scheduling system is configured and staff members are trained, we deploy the application in a live environment. STEP 6: We Support — A dedicated Account Manager and Client Success Team is on tap to provide the enterprise with quick answers andsupport future business growth. When everything is said and done, a properly integrated scheduling solution is streamlined directly into an enterprise’s other core technologies, effectively becoming just another “system” in the corporate infrastructure. Doing so undoubtedly enhances the customer experience and journey, but can also cause great anxiety for operations and technical teams. It’s critically important that stakeholders from the business side properly communicate their needs when it comes to which elements of data should be integrated during the consumer booking journey. Breaks and misalignments can cost them time and delay other projects. Even worse, it can cost them customers. That’s because a successful enterprise customer booking experience depends on the consumer having a pain-free online interaction with the business from the get go. It’s critical that the enterprise — and their scheduling software partner — facilitates its customers’ bookings with the least of amount of resistance, while still obtaining the critical customer data needed to properly integrate systems and market services. In conclusion, because the business requirements of enterprises are complicated and ever-changing, building a scheduling software solution for them is also inherently complex. If you’re part of an enterprise team searching for a scheduling software partner, make sure that the SaaS offering you choose has experience incorporating scheduling best practices into their enterprise-grade technology. It’s also key that the SaaS vendors you’re considering are honest with you during the evaluation process. There must be a clear alignment of your business requirements; you want to avoid software modifications that are non-sustainable for the vendor to support long term. Require access to a test environment and the use of the vendor’s API. If they’re reluctant to give it to you, it’s a red flag, and could signify they just aren’t “enterprise ready” or are perhaps in the early phases of their product evolution without a fully featured API. A good scheduling software provider will support your upfront efforts to understand the entire implementation process. Remember: there’s no fast track to enterprise scheduling, and seasoned professionals understand this. It’s better to learn sooner than later that it’s not just scheduling.